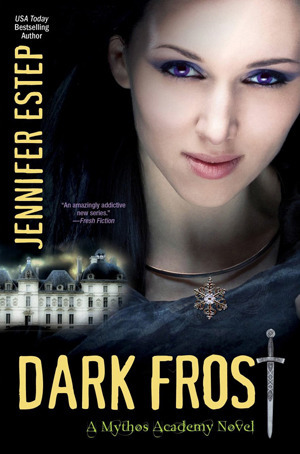 Dark Frost is the third book in the Mythos Academy series by Jennifer Estep and is keeping me thoroughly entertained. Gypsy girl Gwen Frost went through so much in the last book and continues to find out more and more about her unique psychometry abilities which allows her to know, feel and see an object or persons history. We also continue to learn about the warriors at the academy such as Spartans, Romans, Ninjas, Vikings etc. In Dark Frost we have the reapers trying to find the Helheim Dagger, a powerful artefact that Gwen’s mother hid before she died which will allow them to free Loki and plunge the world into a second chaos war, we also find out who one of the main leaders are and it wasn’t someone I had expected. There was action aplenty in this book and I found the pacing to be fast and the plot entertaining but a lot more gruesome than the other books. One thing I really like about these books is the setting, boarding schools are one of my favourites and the snippets we get about it I find enjoyable – you can picture certain areas in your mind, especially the library of antiquities which is filled with many different artefacts. Another thing is the character progression; I feel we are really getting to know all of the characters – Gwen is such a wonderful protagonist, sure she can be flighty and act without thinking but she is still fiercely protective and loyal to those closest to her. A bit more has also been revealed about Daphne and her awakening powers. Logan is still a bit of a mystery, I would love for there to be more page time between him and Gwen because at this stage I still don’t feel that they have really gone forward with their relationship. Vic continues to be amazing as does Nickomedes, Carson, Metis, Kenzie and Oliver. One of my biggest gripes with this series has been the constant rehashing of events and repetitive information, at the beginning of the book it would be alright as there tends to be a bit of time between reading the last book but I am finding it is right throughout which can at times be annoying. Overall, Dark Frost is another well-written an entertaining addition to the Mythos Academy series. “You won't hurt me. I know you won't." Logan said. "How can you be so sure?" I whispered. "In a way, touching her things was like losing my mom all over again--- a dozen little deaths packed into each and every box." You seem to be blowing through this series! But THAT'S IT, I REALLY NEED TO DO A REREAD. I was so attached to Vic. Lovely review - I agree that it definitely got annoyingly repetitive at times. I bought these books one after the other, I thoroughly enjoyed them :-) Vic had me giggling! I loved his snark. The repetition was quite frustrating. Woop, woop! I loved this series. It felt different from other YAs. So happy you liked it. I loved them Jennifer - have you read her new series starter Cold Burn of Magic? sooo good! You are rocking right through these. I liked this series as well. The mystery and the characters kept me going. I don't recall the repetitive rehash, but I read them as they released a year apart so I usually need a refresher. I hope you like the last couple. I need to try this series, I finally read a book by her this year and loved it.